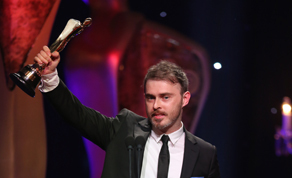 Gallagher was presented with the award for Best Animation by ‘The Young Offenders’ duo Chris Walley and Alex Murphy, at the 2017 IFTA Film & Drama Awards Ceremony last Saturday, April 8th at the Mansion House, Dublin. With a mixed background in both live action and animation, Gallagher was also nominated for ‘Love is a Sting’ last year, which was directed by Gallagher and written by Oscar-winning Irish filmmaker Ben Cleary (Stutterer). 'Second to None' is produced by Damian Farrell, with production design from Aoife Noonan and the vocal talents of Morgan C. Jones. It follows twin brothers Herman and Frederick who must deal with jealousy and ambition when one of them becomes the oldest man in the world. This year’s award saw him fight off tough competition from Sean Cunningham (Define Intervention), Gary Gill (Don't Forget the Bread) and Kealan O' Rourke (The Lost Letter). "I'm delighted to have won the IFTA, it's such a recognition of the talent, hard work and passion that has gone into making Second to None. I was nominated last year with Love is a Sting, but couldn't go because I was getting married! So to be there with my wife on our anniversary surrounded by our friends, peers and a room filled with the best of Irish film talent was fairly surreal and absolutely unforgettable." The 2017 IFTA Film & Drama Awards air tonight at 21:15 on RTÉ One.